In 1982, development started on a charming one-hour television special, Don’t Eat the Pictures, featuring the Sesame Street gang’s afterhours (and unauthorized) tour of The Metropolitan Museum. In search of Big Bird who, in turn, was searching for Mr. Snuffleupagus, the human and Muppet cast roam the museum singing about “the most beautiful trash” and “food art”. Meanwhile, Big Bird and Snuffy befriend an ancient Egyptian prince and search for clues to answer the question, “Where does today meet yesterday?” The Metropolitan Museum of Art seems like the place! While working on the show, Jim came into contact with Caroline Kennedy, a coordinator for the museum, and Karl Katz, the Met’s film and television consultant. In late July, Katz wrote to Jim summarizing their initial discussions. Their idea was to produce a television special in which, “the Muppets set off on an archeological ethnological expedition to discover their roots. In a distant unspecified place, they excavate Muppetamia and even meet some natives that preserve some Muppet linguistics, social and cultural traditions.” Of course, dreadful problems ensue but the excavation is successful in uncovering a long lost Muppet civilization. The newly discovered materials would then become part of an actual exhibit at the museum, combined with artifacts from the Met’s collection, to teach about ancient cultures, mythology and archaeology with a Muppet twist. The hope was that the exhibit would then travel. Jim’s group, including chief conceptual designer Michael Frith and mastermind behind the various incarnations of the Miss Piggy’s Masterpieces from the Kermitage projects, were just wrapping up those projects. 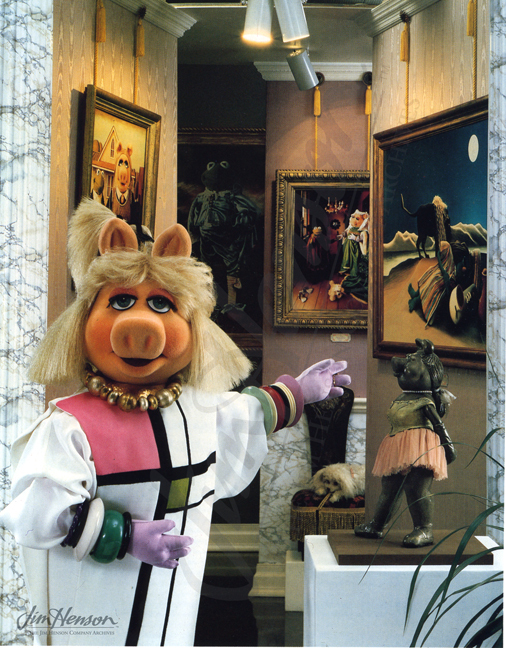 They included an exhibit of Muppet parodies of fine art classics planned for the end of the year along with the release of the related calendar. The hilarious book by Henry Beard detailing the collection was due out in 1984. Building on the Beard relationship (he had also written Miss Piggy’s Guide to Life), Jim commissioned a script for Muppetamia. By the start of 1986, working with Andy Borowitz, Beard had written an outline, a treatment and a full script for a four-hour mini series called “Island of the Lost Muppets” featuring the Muppets in search of their archaeological roots. 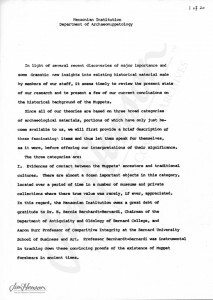 By then, the Metropolitan Museum’s participation seems to have disappeared and the group was in discussions with CBS. By May, CBS was starting to get cold feet and the project had been reduced to a two-hour television movie. Jim remained enthusiastic – meeting notes say that he wanted “…to use lots of video techniques to fill in locations and other incredible set ups.” By the end of the year, however, CBS, Beard and Borowitz were out of the picture. Meeting notes say that Jerry Juhl was now working on what was known “previously as Muppetamia”, but it seems to be a completely different project. It was a treatment for a Muppet feature film called Gonzo’s Really Cheap Muppet Adventure. The eventual script, The Cheapest Muppet Movie Ever Made, though much loved, has never been produced. 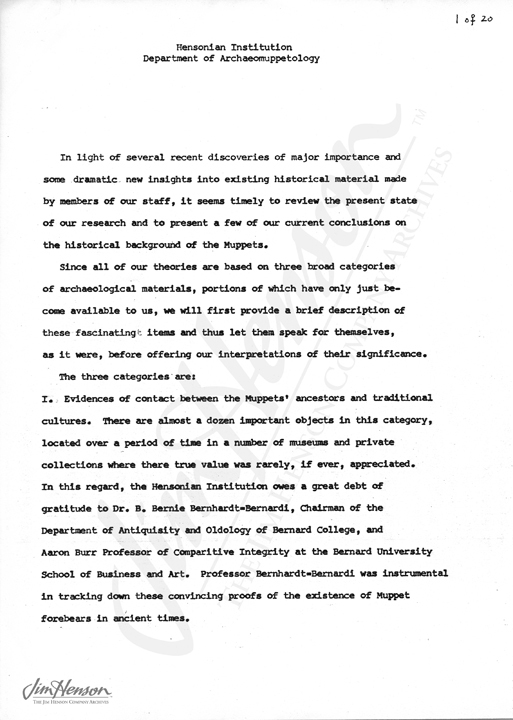 First page of Henry Beard’s “report” on the Muppetamia archaeological finds, 1985. 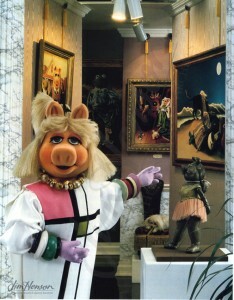 Miss Piggy shows off her fine art treasures. This entry was posted in 07-July '83, 1983, Sesame Street and tagged Big Bird, Caroline Kennedy, Henry Beard, Jerry Juhl, Karl Katz, Metropolitan Museum of Art, Michael Frith, Mr. Snuffleupagus, Muppetamia. Bookmark the permalink.